Zac Efron recently took to social media to celebrate that production had wrapped on the Ted Bundy biopic, Extremely Wicked, Shockingly Evil and Vile. In addition to announcing that filming had come to an end, Efron also shared behind-the-scenes pictures that include our first look at John Malkovich as Judge Edward Cowart. Zac Efron documented his transformation into notorious serial killer Ted Bundy throughout the production with insightful pictures from the set, including some excellent pictures of himself and the Big Bang Theory's Jim Parsons arguing in court. 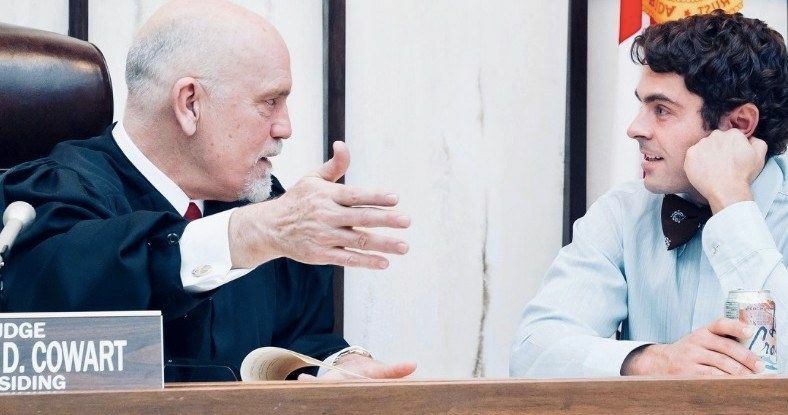 John Malkovich is spotted in one of Zac Efron's behind-the-scenes photos from Extremely Wicked, Shockingly Evil and Vile as Judge Edward Cowart, who presided over the trial and sentenced Ted Bundy to death. The trial was nationally televised and gained a lot of media attention. Bundy, played by Zac Efron, represented himself and even developed a rapport with Cowart. Though Ted Bundy had 5 court appointed attorneys, he largely took care of most of his defense, expecting his charm to get him out of the whole situation, which obviously didn't happen. The last round of pictures that Zac Efron shared from Extremely Wicked, Shockingly Evil and Vile included our first look at Jim Parsons as Larry Simpson, who was the lead prosecutor who convicted Ted Bundy in the Miami courtroom. Parson and Efron can be seen in the pictures in the heat of argument and one can only imagine Parsons playing a cool, calm, and collected prosecutor ready to lose his cool after witnessing Efron's Bundy try to use his charm on the judge and jury, much like he did his victims. We've also gotten to see images of Metallica's James Hetfield, who takes on his first acting role in the movie. Extremely Wicked, Shockingly Evil and Vile is told through the eyes of Elizabeth Kloepfer, played by Lily Collins who was Bundy's long-time girlfriend. Ted Bundy was executed in 1989 and right before his execution, he confessed to 30 homicides that he committed in seven different states between 1974 and 1978. Kloepfer claims that she had no knowledge of her boyfriend's notorious actions. The movie is said to center more on the charm of Ted Bundy over the murders that he became infamous for. Zac Efron recently admitted that he didn't do "full-on method acting" to play Ted Bundy, noting that he "didn't do anything weird to people," which is a good thing. However, at the end of filming every day, he would go through a "spiritual cleanse" and have friends and family sage him. Efron also says that Extremely Wicked, Shockingly Evil and Vile doesn't glorify Ted Bundy in any way, noting that, "He wasn't a person to be glorified." Instead the movie tells a story about how the world was able to be charmed by Bundy's personality. From what we've seen, it looks like Zac Efron was the right man for the job. There is no release date set for Extremely Wicked, Shockingly Evil and Vile, but that should be announced soon. In the meantime, you can view the last behind-the-scenes photos from Zac Efron's Instagram account. The upcoming biopic about #TedBundy, Extremely Wicked, Shockingly Evil and Vile, has wrapped filming. @ZacEfron announced it via his #Instagram page with the following pictures.